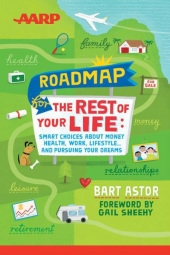 Bart Astor is a recognized expert in life's transitions and eldercare. He's the author of the Washington Post bestseller, AARP Roadmap for the Rest of Your Life: Smart Choices about Money, Health, Work, Lifestyle, and Pursuing Your Dreams. His unexpected personal journey led him to write his best-selling book, Baby Boomer's Guide to Caring for Aging Parents, now in its second printing and critically regarded for being today's must-have healthcare resource. Bart has appeared on numerous TV and radio shows, including ABC's "Good Morning America," PBS's "MarketPlace," AARP Radio, Boomers Rock radio, and Ric Edelman's "The Truth About Money." His perspective comes from personal experience, both good and bad, and sometimes that's what matters most. Look for his next book, Graduating from College without any Debt (or Almost) coming out in the fall. Bart can be contacted at Bart@BartAstor.com. Follow him on Facebook and Twitter at #bartastor. The 50+ years have been called our Second Adulthood, Adult Part 2, even third age. But whatever it's called, those of us in the demographic - baby boomers most of us - have 20, 30, 40 or more years left. So as it says in the AARP Magazine, "At 50+ we still have a lot to look forward to." In this column, I will write about those "Real Possibilities for 50+" and focus on various ways we can make those years rewarding. I'll write about attitudes and solutions, options and challenges. You'll get to meet some people who share with us their stories and life lessons. And you'll read about how you, too can re-imagine your life after 50. So check back often to see the latest installment. And please comment or add your thoughts to each article.